A love letter to iced coffee. I am really, really quirky. If I had to write down a different quirk a day, there would not be enough days in history to list them all. Today I will share just two. I love hot food. Both in taste and in temperature. I do not love hot drinks. *Salted Caramel Hot Chocolate from Starbucks is the only exception. But it has to be freezing cold outside for me to even consider drinking it. (Below 70º is freezing cold to us Cali wimps.) I will drink hot coffee if there is no other options. But I do not prefer it. I love sweet treats. I am a total sugar addict. I do my best to give it up for lent each year, but it is total torture. I do not love sweet drinks. I love Diet Poison Pepsi, but I will never, ever drink a regular one. 100 out of 100 times I would chose a bowl of ice cream over a shake. Sugar never meets my coffee. Ever. 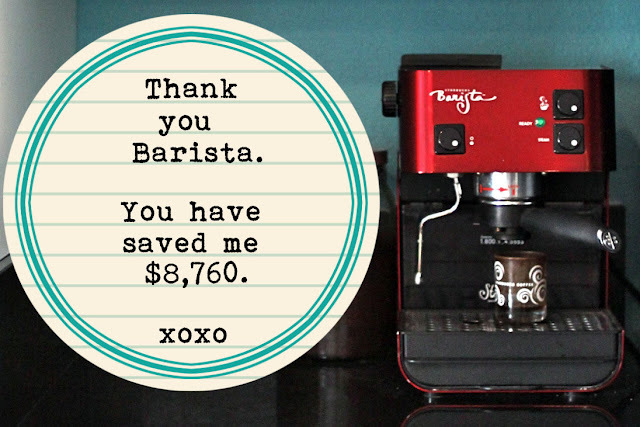 Eight years ago, for my birthday, Jason surprised me with this Starbucks espresso machine. But the sneaky person he is, wrapped it up inside a bread machine box. I wanted an espresso machine. I did not really want a bread maker. That's a pretty mean decoy, if you ask me. Every single day, many times more than once a day, this scarlet beauty makes me the most delightful shots of caramelly rich coffee. I did a little math to figure out how much it has saved me... The figure is astonishing. I love this thing. Love it. But because I drink my coffee iced, we do things a little differently. Each night after the kids go to bed, Jason and I do our chores. General tidying up, making lunches, etc. My non-coffee drinking husband, lovingly makes me three shots of espresso each night. He puts them in a glass and then puts the glass in the fridge. In the morning when it is nice and cold, all I have to do is add ice and almond milk. It works perfectly for my non-morning person self, and is one less thing we have to make before getting everyone out the door. But sometimes I am running late, on vacation or need another coffee and just can't get it together enough to use the scarlet beauty. Good thing I have a dear friend who works at Starbucks and shared me the awesome that is VIA. To be honest, I had seen it in stores, read the ads, even stared at it while I was ordering my passion tea (unsweet, obvs), but thought it was weird, expensive and pointless. Also I thought that it was just for hot coffee. Because of that it was dead to me. Then at bunco one night, I saw her pour it into a water bottle and then over ice... Intrigued I asked/ begged to try it. Wow. Just wow. It was good. Really good. Fresh, rich, flavorful. Not at all what you would imagine could come from an strange little pouch. I was an instant fan of the VIA instant. So when we were at Costco buying supplies for our Bass Lake trip, you better believe that a big old pack of VIA went into the cart. It was either that or bring the scarlet beauty with me. Jason opted for a week off of espresso duty, I opted for VIA-tasticness. So here is my perfect iced coffee in five easy steps. *A cup with lots of ice. Pour the packet into 8 oz. of water Shake it up nice and good so you get the foamy foam. That is what will make it taste more like what you would get if using an espresso machine. Done. Icy, rich, happy coffee in less than a minute. Not rocket surgery is it? But it sure does make crazy days a little less crazy. If you are the type that loves sweet coffee, you can buy the actual syrups at Starbucks. It is a bit of an investment at first, but I'm told that they last a really, really long time. Just add the syrup in before you shake it up. Sugary goodness abounds. There is chatter that Nescafe's little instant packets are going to give the VIA packets a run for their money, while saving you some money. I can't speak from experience, but they are giving samples away so you can taste for yourself. You can sign up here. I am anxiously awaiting mine, since I used my last VIA this morning. Hurry, Nescafe! Hurry. How do you drink your coffee? If you don't drink coffee, how do you survive? I am married to a morning loving, non-coffee drinker, who actually sleeps even less than I do. I just don't get it. I was not born with the naturally caffeinated gene. I love an iced, nonfat caramel macchiato. Yummy, sugary, caffeinated goodness. Miss you, friend!! coffee = bad. diet coke = heaven. Hi, I'm Denissa and I'm a sugar addict too..oh and coffee addict too..hello I have 3 boys! I DO NOT know how mommies function w/out it!! I do have to have sweetened coffee though. My fav. is the Italian sweet creme creamer..yum :)the picture w/ the milk into the coffee is awesome! I'm going to have to try the almond milk. I am a morning hating non-coffee drinker. I heart Diet Coke. or just three pumps of sugar to cut the strong flavor at SB. Did you just say rocket surgery? You crack me UP!!!! Just in case you haven't tried it...you have to try the salted caramel hot chocolate over ice...its amazing! An ice cold Dr. Pepper always does the trick for me. Bad thing is, I just recently got off of the stuff and let me tell you, that was one of the hardest things I've ever done, haha! It's true though. Will definitely have to try this coffee thing you showed...looks awesome! i don't drink coffee but i do drink a lot of diet coke and/or diet dr. p! At Starbucks I am a nonfat white mocha kinda gal. Iced, hot, frapped I could care less, I love them all. Now I think I need to search out some almond milk at the store this week for my coffee at home. We have a K-Cup machine now because my espresso machine started spewing water in every direction a few months ago. Not cool. Most of the time I drink my coffee hot and black - very black! I need as much caffeine as I can get! I am loving your blog! I love French blend coffee with 2 cubes of sugar, 3 creams and a splash of raspberry syrup. Have to have it every morning while I let my chickens out to roam. Oh its the best! I like my coffee hot or iced always with cream and always with flavor like caramel or mocha. I used to crack open a diet coke every morning but the fake sweetener started messing with my tummy. I need to the caffeine to get going too! If I am at home... I will usually just add milk and some sugar. Again hot. Unless it was this past summer you broadened my horizons and I tried a iced coffee. loved it. the key is to melt your sugar in the hot coffee before it cools! Another way i've done it is pour a hot cocoa packet into my coffe with a little bit of water. yumm. I'm not a coffee drinker... love the smell though. I drink coke/pepsi/dp. whatever we have in the house to try to get me going in the mornings. Sometimes it isn't enough... and I start wondering if coffee would wake me up better, and then start wishing I liked more than the smell. This time of year I can't get enough Starbucks Pumpkin Spice Latte, but there is a local coffee shop that makes it with REAL pumpkin...pie in a cup I tell ya! Have you tried the Almond Milk on cereal? YUM! I haven't tried the Silk brand yet, I have always used the Blue Diamond kind. We do hot coffee in the morning, iced in the afternoon (if needed). Julie, I have two words for you (besides "You're awesome! "): Coffee Toddy. It's a cold brewing method that makes a carafe of coffee concentrate that you can then keep in the fridge and then mix with water, milk, or whatever (one batch lasts us 9-10 days). We're self-confessed coffee snobs and this makes the most wonderful iced coffee ever--full-flavored but without any bitterness. We bought ours online. It's easy and always ready to go--your husband would LOVE it (less work)! You can find' em online (search: coffee toddy) or can even rig up a cold brew system at home without the official "toddy" thing. We were cold brew skeptics but now we're fanatics! hot, hot, hot nonfat latte with just a splash of vanilla or caramel syrup. i heart iced coffee, but find myself drinking it waaaaaay toooo faaaaast. i like that the hot stuff forces me to sip and move a little slower. I like my lattes hot, but on the occasions I get an iced latte I notice that I drink them a lot faster! Have you seen that they have vanilla VIA packets now? I tried one recently and it was quite good. Surprising really. And I do love that they make a specific iced VIA when clearly, you can use the regular ones for iced coffee just fine! I am a caffeine addict (admittting it is the first step to recovery...except I don't want to go there!) Looking forward to trying the iced coffee with almond milk. BTW, I'm so glad BH mentioned your blog. I've been following it since and find you a lot of fun! I, too, do not like hot beverages. None. including coffee ... so ... my vice is iced tea, cucumber water, or coke zero. I do not drink coffee ever. I wake up with a tall glass of water and then an afternoon treat of diet pepsi (vanilla when it's cold, cherry or lime when it's warm) keeps me from crashing midday. My husband drinks coffee all day long- I have no idea how he sleeps. I drink a hot coffee double~double every morning...double cream, double sugar. I love it...I need it. Yum that sounds good. But, I drink my coffee with loads of cream and sugar. Very unhealthy,so I have actually stopped drinking coffee. And, because of all the sugar I put it in it, I felt like I had a mid-morning crash coming down from all the sugar. So,I quit, but as it gets colder,I may have to sneak in a couple cups a week. I am a coffee and a Pepsi girl. I am also a fan of a good non-fat Chai latte. I have been very unsure of any kind of instant coffee - it reminded me of my grandma and her yucky Sanka instant coffee, blech! But I signed up for the free sample from Nestle - and I will make your incredibly simple instant iced coffee goodness! I'm not a coffee OR Starbucks fan. I don't do coffee - never have, the taste is simply awful to me. Trust me there have been times in my mommyhood (read: my darling oldest daughter who didn't sleep through the night the first year of her life) I wished I was a coffee person, but I just couldn't/can't do it. I get caffeine from soda and tea. PS I love the phrase - naturally caffeinated person! I am married to one of those as well! I'm one of the crazy people that doesn't drink coffee ... as in have never, ever even tried a full cup. It even made my mom nauseous while I was in-utero (see I was wired this way). But I must, must, must have my Starbucks Black Iced Tea (thank you Tazo for this wonderful blend). Thankfully I can buy it from cooking.com in the "gallon" bag size, just like the back bar at SB. And they sell the Passion Tea too (sorry, couldn't help but share). BUT, I do get 8-9 hours of sleep a night ... so I suppose I don't need quite the caffeine boost that others do ;). 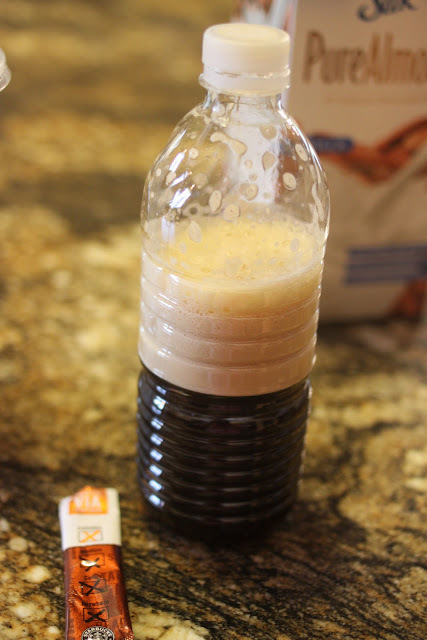 Thank you for the awesome iced coffee idea! I have a VIA sample packet sitting in my pantry. So excited to have my new iced drink tomorrow! I absolutely DO NOT function without coffee in the morning. But I like mine hot with a little sugar and LOTS of flavored creamer, usually vanilla or hazelnut. I also like hot chai tea mixed up the same way as my coffee. 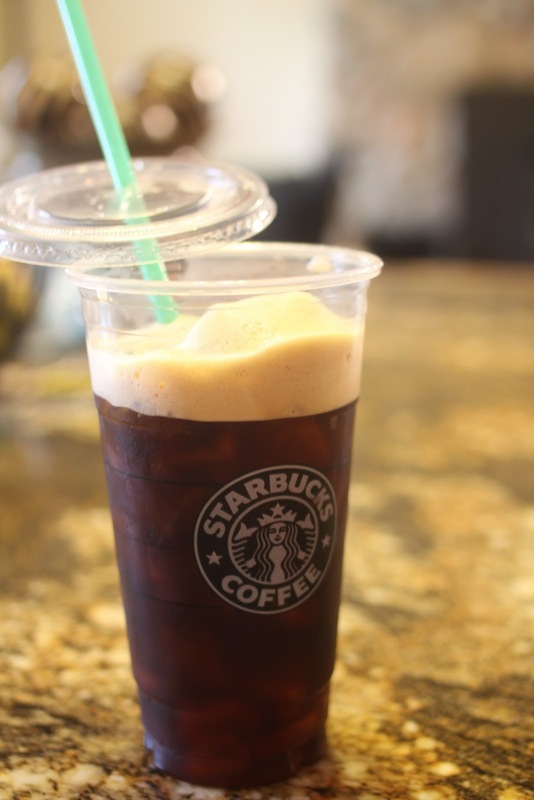 However in the summers, I can't do the hot coffee, so I love this idea of the iced coffee goodness! Thanks! so read your post and since I am a HUGE silk fan though I would start putting some vanilla soy in my iced coffee instead of creamer to save myself a million calories. It was pretty good. not as good as my creamer but pretty good. So today I was at the grocery story and looked for the almond silk. found it, in dark chocolate. Um, Y-U-M!!!! I had to have 2 it was so good and still 100 or so calories less than my creamer. Thanks for the fab idea Julie!! purchased VIA today, can't wait to try it! two pink sweeteners and ALOT Of half and half! Yum...I'm at least a 2 cupper a day! OMG we have the same kind of husband... just can't get it... He starts the day... singing!!! My daily mug of hot coffee is Starbucks Caffe Verona home brew with International Delight dulce de leche creamer. Must have 1 mug every day when I get up. That flavor of creamer can be hard to find, but I. Must. Have. It. Sometimes in the summer I don't want anything hot to drink though, so then i just have iced tea in the mornings. With sugar and a tiny squeeze of fresh lemon. Oooh yeah. 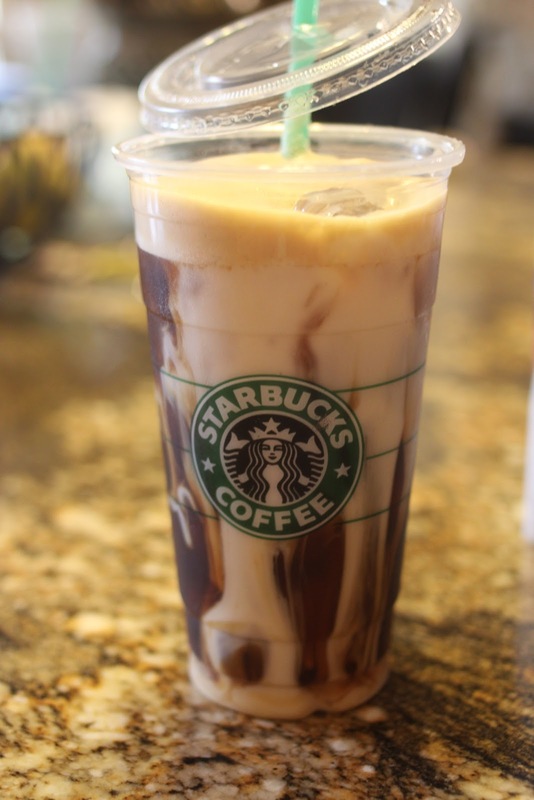 I love the iced coffees at Starbucks (iced skim white chocolate mocha is my fave) but the ones I have made at home never taste very good to me. We do have a law here though that when it is snowing out you HAVE to get a Starbucks peppermint mocha. It's a law because I say it is. Snowy weather and peppermint mochas were just MADE for one another. Cannot have a snowy day without the mocha, it just isn't right. My sweet hubby brings me a mug o hot coffee in bed every morning!! how do I love him... let me count the ways!! ha ha! *ahem* anyway... I am down to 2 mug in the am and if I need that edge in the afternoon I pull out a via or a Nescafe!! Hazelnut thank you! ;) They are both lovely!! ;) I need to try the iced via... I have only used hot up til now! They are also fabulous when camping!! YES via makes awesome iced coffee! I've done it many a time. And I was going to say that the instant nescafe is also really good but I see that you've covered it. And "it's not rocket surgery" is totally my line. Cracks me up every time I say it. Because I'm such a blonde. Have you tried the starbucks iced version to add to your water bottle? a little sweet! When r u coming over for some silhouette fun? all the kids can play while we create! I know. I never should have tried VIA first because I knew Starbucks would use it to cast a spell over me as usual. But I think I might still be in the honeymoon period of the sheer ease of making iced coffee this way that I can ignore the taste of feet and poison temporarily. And it is hard to argue with 14 cents per coffee packet with the Nescafe vs $1 per coffee packet with VIA. Love you blog! Thanks for stopping by mine! going through all the posts that came on my rss feed when I added you tonight & love this one! I recently proclaimed my love for that very same barista machine here: http://styleberryblog.com/2010/09/14/the-best-part-of-waking-up-how-to-make-a-latte-at-home/ !!! Def going to try almond milk! !